At the bottom of the pyramid horizontally, you will notice 13 boxes of equal size called 'Heavens', further divided in to 7 days and 6 nights. Vertically, you will notice 9 'Underworlds' to further define the time line. 9 Underworlds are major creation cycles, wherein there is a process of 13 steps of development from seed to fruit. The lower underworlds reveal the evolution of Consciousness manifesting in physical ways, such as a Galactic matter and biological species. There are different frames of consciousness expanding from Cellular to Universal. The factor 13 is seen in 13 heavens at the bottom of the pyramid. The factor 20 becomes evident in the difference between each successive underworld. Note that each successive underworld is 20 times shorter and this 13: 20 ratio is the one , which creates the entire fabric of the Universe. 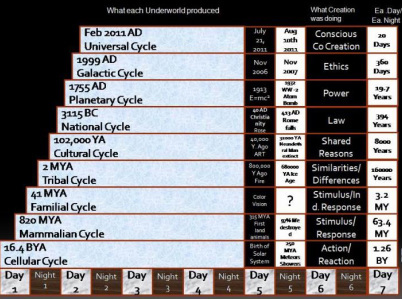 Presently we are in “Galactic Cycle – Day 6 “and soon we are moving into Universal Cycle .This Mayan calendar ends in 2012 . This could be the next big evolution step in the process of creation . 2012: The Coming End of Our Age? According to some people's interpretations of the famed Mayan Calendar, civilization as we know it will end in 2012. Do we really have so little time left? Do we need to be frightened? Nervous? Awed? Anxious? Mildly or intensely curious? Do we need to re-look at our investment portfolios? Are we doomed or saved? Just what is this 2012 event? Perhaps you've heard about an event which is to signal the end of time or the end of the world. The event, scheduled to occur in 2012 (some say 2011), is when the ancient Mayan Calendar ends. In 2012 the Mayan Calendar simply stops. Finis. Done. Over. Is this Mayan event equivalent to the promised biblical Armageddon? Let's take a brief look at the Mayan calendar. The Mayans – living in the Yucatan Peninsula in Mexico – are an old culture, dating back to the time of the early Roman Empire in Europe. Their culture and civilization gave rise to several subsequent cultures: the Olmecs; the Toltecs, and the Aztecs. They built pyramids with the same precision as the Egyptians, though not quite as large. They had a very sophisticated understanding of astronomy and mathematics, all of which is reflected in the complexity of their calendar. Then they mysteriously seemed to disappear. There are nine Underworlds in the universe of the Maya. They are called Underworlds, not because of a Mayan concept of Hell, but because of the activated crystalline structures in the earth's inner core. These crystalline structures were not "scientifically" known by the Mayans, but were "sensed" or "intuited" by the spiritual priests and tribal leaders, chief of whom was Kukulcan – better known as Quetzalcoatl in the Aztec culture. Each Underworld consists of seven days and has a duration – a length of time – that is equivalent to twenty times the length of the subsequent underworld. These lengths of time are called "cycles" in the Mayan Calendar. The last day of each cycle contains all of the following cycles, so all cycles will end at the same time. Each cycle is divined to accomplish a "greater" sense of consciousness: Build on the previous cycle and, simultaneously, lay preparations for the following cycle. A simplified summary follows (for more information on this subject, I would recommend 'The Mayan Calendar and the Transformation of Consciousness' by Carl Johan Calleman, PhD. During the initial cycle, the universal consciousness moved from the Big Bang and the creation of matter to the emergence of cell structures. During the second cycle, consciousness moved from cellular structures to mammalian organisms. and from primates to humans in the fourth cycle. During the fifth cycle, humans raised their consciousness with the development of a spoken language and a community organization. The sixth cycle began with the development of a written language and a sense of a national consciousness – a consciousness of being a "people" among other organized "peoples." During the seventh cycle, beginning about the time of The Industrial Age, the idea that we were a global people was germinated. The eighth cycle, which we are currently in, will see that embryonic sense of a global community come to fruition. The last cycle – or age – the Mayan Calendar records began in early 2011 and will end later this year. It marks the end of our dualistic civilization as we currently know it – east/west, rich/poor, either/or, us/them, me/you – and the beginning of a new order of life: Global citizenship; Intuitive knowledge; Sharing of resources; Cooperation rather than competitiveness; Spirit-driven rather than materialistic-driven. As mentioned earlier, each "cycle," according to the Mayans, is twenty times shorter than the one preceding. This rather simple fact of the Mayan Calendar very neatly explains what we have all suspected and often hear: Events not only seem to be speeding up, events are speeding up. The first cycle began 16.4 Billion years ago, close to when astronomers now fix the Big Bang event and the beginning of the creation of matter. The second cycle began 820 million years ago, near to the timeframe anthropology and geology use as the beginning of the first animals. The third cycle began 40 million years ago, near to when scientists now believe was the emergence of the first primates. The fourth cycle began 2 million years ago, near to when anthropology places the emergence of the first humans. The fifth cycle began 102,000 years ago with the probability of the first spoken language, according to anthropologists. The sixth cycle began 5,125 years ago (circa 3100 bce) with the emergence of the first written language – the Sumerians. This sixth cycle, known as the National Underworld, is also the beginning of the Mayan "Long Count" calendar. The seventh cycle (known as the Planetary Underworld) began 256 years ago (circa the mid-Eighteenth Century), about the time historians place the beginning of the Industrial Age. It was near the end of this cycle that the 1st Harmonic Convergence occurred in August 1987, ushering in a countdown to the end of the Mayan Long Count. The eighth cycle began January 5, 1999 and lasted 12.8 years (4680 days). It is the cycle we have just completed and is called by the Mayans the Galactic Underworld. The Galactic Cycle will be marked by the realization of the true impact of information technology on the global economy, as expressed by the use of the Internet. The marked rise in the importance and role of intuition and the spiritual unity of the global community will also be quite evident. The movement will move rapidly from an either/or (or us/them) mentality to one of true global cooperation and sharing. This phenomenon is often referred to as one of higher vibrations or the beginning of a non-dual cosmic consciousness. Incidentally, the 2nd Harmonic Convergence occurred near the end of this cycle in May 2010. Some believe the end of this ninth cycle is also known as the birth of the 6th Sun and the 5th Earth – the beginning of a new 5,125-year cycle. At the end of the calendar, according to the Mayans, humankind will have direct divine contact, understanding and consciousness. This will not happen all at once, just as the Industrial Age, which historians generally mark with the invention of Fulton's steam engine, didn't happen overnight. However, as industrialism grew, those businesses and industries that refused to adapt simply didn't survive. Think of this analogy: Two blacksmiths are standing in front of their shops, across the road from one another, when the first automobile comes putt-puff-putting down Main Street. One blacksmith says to himself, "Harumph! Those 'iron horses' will never make it! I fix wagon wheel rims and hand-held plows, and I shoe horses. That's what I'll continue to do." Unfortunately, he probably went out of business. The other blacksmith says to himself, " I don't know if cars will last or not, but I do know that it's made of a lot of iron and I fix iron things. If it breaks, I think I can make the parts to fix it, along with wagon wheels and shoeing horses." That blacksmith probably did just fine. Perhaps he was the grandfather of Mr. Goodwrench. It's an attitude. It's all in how we perceive change. If we perceive change with fear, we will resist it, like the first blacksmith. We recall the axiom: What one resists will persist. If we welcome change as part of a divine plan (however you choose to define that), then we will adapt, grow, evolve, and even flourish. The end of the Mayan Calendar is not predicting a physical end of the world – just like a physical end of the world is not described in the Book of Revelations in the Bible. But, according to the Mayans, this last Cycle, the Universal Underworld, does mark an end of the world as we know it – as we have come to understand how things work. This is similar to the Book of Revelations that describes an end to the world as the writer perceived it to be at the beginning of the Second Century. John of Patmos wrote Revelations in visionary "code", since to be caught with recognized Christian literature was a punishable offence in his time. In a sequence of dream-like visions, he perceives the defeat of evil empires and the establishment of a reign of peace, ruled by God, where we are freed from pain and suffering. As these shifts in consciousness or shifts in perceived reality occur, there will be persons – those in power, those invested in keeping the things the way they have been, those immersed in religious systems that assuage people's fears – who will "fight" to prevent change. So there will be conflict, as is always the case with change. Could the conflict become so severe that nuclear weapons could be unleashed and the earth would become uninhabitable? It certainly is possible. Is it probable? I don't think so. 3) Where we perceive ourselves working, struggling and fighting within all the elements of a dualistic view of the world where we see everything in terms of right/wrong, good/evil, plenty/scarcity, judging/ comparing (from our us/them point of view, of course) and have created a world filled with fear, guilt, shame and resentment. We are moving to an Age of Peace and Harmony, summarized in the ancient Mayan greeting In Lak'ech or "I am another you." Other spiritual movements have similar traditions. Egyptian and Vedic traditions describe the transformation of consciousness. The Incans, the Hopi, and the Keys of Enoch discussed the return of the Children of Light and the rise in spirituality and decline in religion. During the last fifty years, Share International has been predicting the emergence of Maitrayea, the world teacher for the new age, and the hierarchy of spiritual masters, including the Christ, the fifth Buddha, the Imam Mahdi and the Messiah. There have been recent writings, such as Lee Carroll's 'Indigo Children', that describe a higher form of consciousness and awareness that is emerging today – an emergence that is visible as an indigo-coloured aura surrounding these gifted children, many of whom are misunderstood today. Astrologers have been predicting our movement from the Age of Pisces, marked by over 5,000 years of idealism and patriarchy, to the multi-centuries lifespan of the Age of Aquarius. This new age will be noted by the resurgence of the power of "the total group" in the raising of consciousness. The Age of Aquarius also will bring back the Divine Feminine to create a balance in "unity" consciousness – a healing of the energies between the masculine and the feminine. Just think what is about to happen: Peace; Harmony; Sharing; Cooperation; Caring for Mother Earth; A Truly Global Sense of Community; The Spirituality of Love (or an Honest Spirituality) Replacing Fear-Based Religiosity. Wow! Rejoice in the end of this world, as we have known it. Rejoice in the beginning of the world we have longed for. Donald O’Dell holds a Master of Divinity from Princeton Theological Seminary and is the author of How the Bible became the Bible (Infinity Publishing, 2006), recipient of the Florida Writers Association 2006 Royal Palm Literary Award. Visit http://www.DonODell.com for more information.